Our Aga Cookers come in two designs; the older style Aga, which is called the Standard (as seen above), and also the Delux style which is illustrated below. 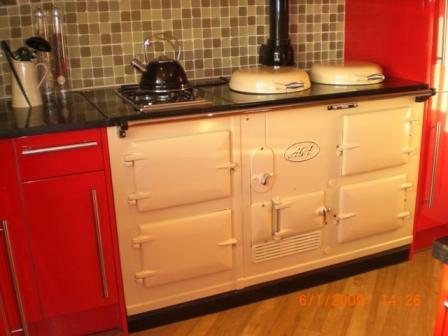 This Aga has 2 ovens. The top oven is the main cooking oven with the bottom oven used for simmering. In a purpose built gas Aga the controls are situated behind the left hand single door. 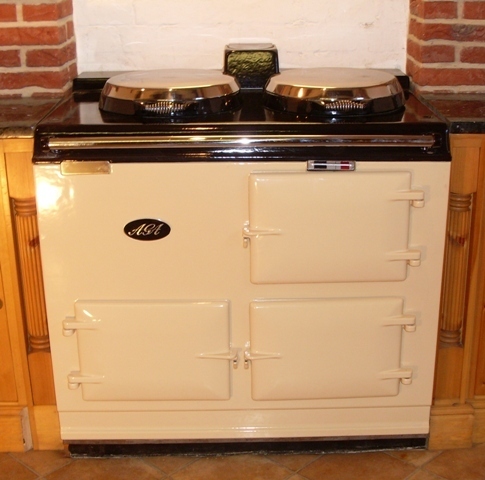 The purpose built oil Aga has the controls situated externally on the left or right. With a converted gas or oil Aga the controls can be situated to the left or right and be hidden in a cupboard or sit happily on the side of the Aga. The top of the Aga consists of 2 round, flat cooking plates with lids. The lids can be either chrome or enamel depending on choice. The 4 oven Aga has a roasting oven, a baking oven, a simmering oven and a warming oven. In a purpose built gas Aga the controls are situated behind the single middle door of the Aga. The oil Aga and the converted Aga have the controls at the side; left or right to suit. The top of the Aga has two round, flat cooking plates with insulated lids and a large square, flat plate for warming, with no lid. This flat plate can be removed and the Aga fitted with a gas or electric hob for extra cooking potential. 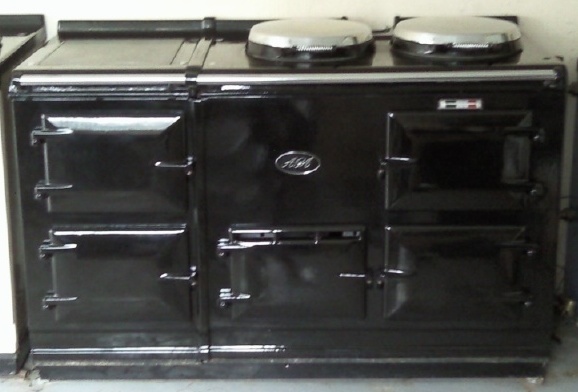 Should I chose an original gas/oil Aga or a converted Aga? A lot of people are under the misconception that a converted Aga Cooker will not perform as efficiently as a purpose built Aga. However, I have been successfully converting AGAs for many years and they all work on the same principal - small heat sources warming up a large amount of cast metal. The heat is retained within a well insulated body, with the hot plate and simmer plate directly under two insulated lids and a large roasting oven and large simmering oven. The ovens are set at a constant temperature. To vary the temperature of the cooking the oven racks can be placed higher or lower in the ovens. In my opinion the original solid fuel Aga when converted is a superior cooker compared to the purpose built Aga because all the castings in these cookers were originally designed to take the rigors of solid fuel. The castings are heavier and more robust, retaining better heat than modern day purpose built cookers.